Livestock Type – Coral. A large polyp stony (LPS) coral from the genus Euphyllia, specifically the divisa and paradivisa species. Common Name – Frogspawn. Gets its name from the tight clusters of polyps that are similar to clusters of frog eggs. Commonly confused with other members of the Euphyllia genus, especially hammer coral (Euphyllia ancora), as appearance and care is similar. Care Level – Moderate. Frogspawn need adequate lighting and space to grow, can be fickle about water flow, and benefit from target feedings. Otherwise, they are among the low-maintenance LPS. Environmental Impact – Low. Branching frogspawn grows multiple heads outwards from a single base. Hobbyists will trim its size by breaking off one of the heads and will often trade the fragged head to the store or to a fellow hobbyist. Should I Put This In My Tank? – Frogspawn makes a stunning accent piece. It comes in a range of colors, from pearl white to vivid purple-green. When fully expanded, the coral will sway in the current and the movement adds a sense of life to the tank. Unlike many stony polyp corals, frogspawns do not need intense lighting. However, it does have specialized requirements and can encroach on other corals, so this should not be an impulse buy. Does It Play Well With Others? – No. Frogspawn deters encroachment and predation by stinging invaders. Frogspawn should be separated from all other coral and care taken to ensure that it will not touch competing livestock when fully expanded. This includes sweeper tentacles, which can be longer than the tentacles forming the body of the coral and are extended to catch prey and deter encroachment. They also consume meaty foods, so some of the wild livestock (e.g. : mysid shrimp) might be ingested accidentially. How Will This Species Piss Me Off? 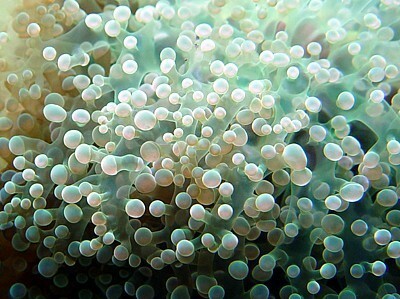 – If you are careful with placement and maintenance, a frogspawn is a low-stress coral. You will need to remember that they are carnivorous in addition to photosynthetic and if you forget to feed them meaty foods they will gradually deteriorate; if you do feed them frequently, they will grow rapidly and might exceed the space you’ve left for them. There are diseases specific to the Euphyllia corals which can wipe out single heads or the entire colony. They are also vulnerable to sudden environmental changes and require stable calcium levels in the water to thrive, but these conditions are common of many stony polyp corals. Some species of fish, such as dwarf angels, might pick at the soft tissues; clownfish have been reported to host in frogspawns, sometimes damaging the coral in the process. There are associated health hazards in keeping frogspawn (see below). What Can I Expect To Spend? – Single heads of frogspawn are a frequent trade-in and are found throughout aquarium stores. The cost for these will depend on size and color, but it is unlikely to exceed $20 to $25. If you are asked to pay more, consider shopping online where you can get wider variety in colors for a few extra dollars. Any Health Hazards? – Yes, they sting and burn exposed flesh. I have two frogspawns, one in the 30g and one in the 65g. The frogspawn in the 30g has 10 heads and I burn the everloving crap out of my arm when I move around it in the tank. Sometimes the burns are so bad they look like an acute attack of poison ivy; this includes the itching and the weeping. ~ by KBSpangler on January 22, 2010. Hi, would it be possible to get the contact for Diogo Lopes so that I can ask to use his amazing photos of the Frogspawn Coral Closeup?